President Barack Obama had a pretty good year. Not only was he popular with voters, but his victory tweet was the most popular post on Twitter in 2012. 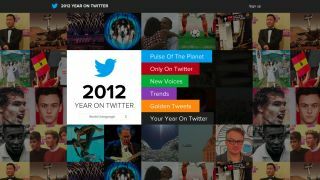 Twitter announced Tuesday the launch of 2012.twitter.com, a site celebrating the impact tweets had over the last year. It breaks down and explains the year's most retweeted posts (like Barry's), biggest trends and most popular hashtags. "In 2012, everyone on Twitter brought us closer to moments and places that used to be far away or inaccessible: A tweet from the bottom of the ocean. Tweets from Mars," Karen Wickre, Twitter's editorial director, wrote in a blog post. "All of these and millions of other such moments were ours to experience directly wherever we were, in the midst of work or play or travel." The top two tweets to set the world ablaze this year received the title of Golden Tweets. The distinction went to the pair of posts that got the most retweets around the world. Obama's tweet was short and sweet, only three words: "Four more years." It was posted moments before he took the stage to confirm his win over opponent Mitt Romney on Nov. 6. The post was retweeted 810,000-plus times in more than 200 countries. The other Golden Tweet comes from social media golden boy Justin Bieber. The singer's final farewell to a sick young fan was reposted more than 220,000 times at the end of September. Honorable mentions for the Golden Tweeties (we're lobbying for that name) include Green Bay Packers player TJ Lang venting his frustrations over the the NFL's labor dispute with referees (98,000-plus retweets), a medal report from Great Britain's Olympic team (67,000-plus retweets) and a wedding announcement from popular Japanese voice actor Kouichi Yamadera (68,000 reweets). The social media site also marked the events of '12 that generated the most buzz on Twitter. These "Pulse of the planet" moments include the Summer Olympics, the U.S. election, Superstorm Sandy, the Japanese movie "Summer Wars" and the death of singing legend Whitney Houston. 2012.Twitter also noted the biggest flash-in-the-pan moments, or the trends the generated the biggest spikes in hashtags. #tcot (top conservatives on twitter) dominated the political sphere while Syria was the most tweeted about country. The movie Think Like a Man and the animated show Family Guy stole the stage in the entertainment world, while the Coahella music festival drew quite the crowd as AT&T got the top tech tweets. Twitter also highlighted its newest high-profile tweeters, including funny man Steve Carell and Pope Benedict XVI. Though the godly twitter handle @Pontifex has yet to post a peep, the Papa already has almost 630,000 followers. The new site is a goldmine for those social media addicts who relish in distilling life's big moments to 140 character or less. And for those wanting to know their personal Golden Tweets of 2012, Twitter partnered with social media management company Vizify to provide stats for individual users.